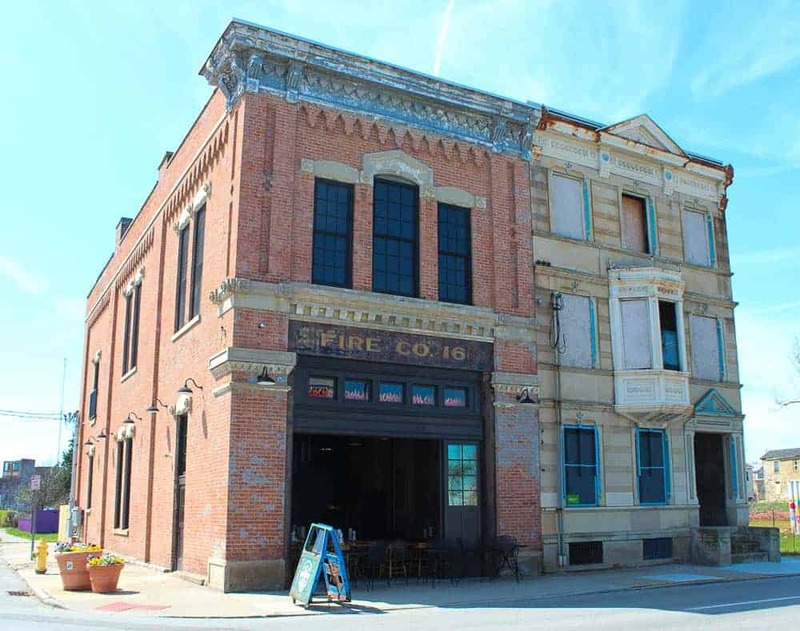 Here we are with another installment of 365 Things to do in Cincinnati and today we are featuring an old favorite in a new spot – Fireside Pizza. Like us, you may have experienced the crispy pizza goodness that Fireside delivers from their traveling wood-fired pizza oven that frequents Findlay Market on the weekends. 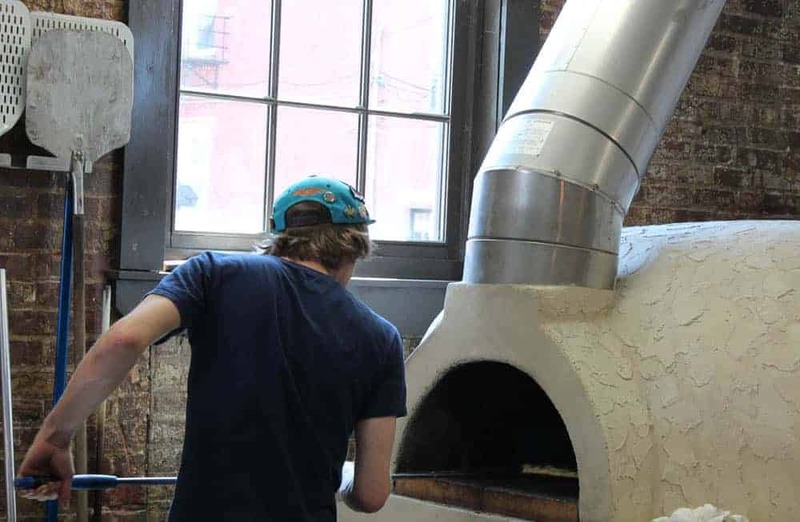 I am always thrilled to see their brick oven when we arrive at Findlay Market and I have had nothing but great pizza from them. So when a friend suggested we try their “brick and mortar” spot in Walnut Hills, I was all in! 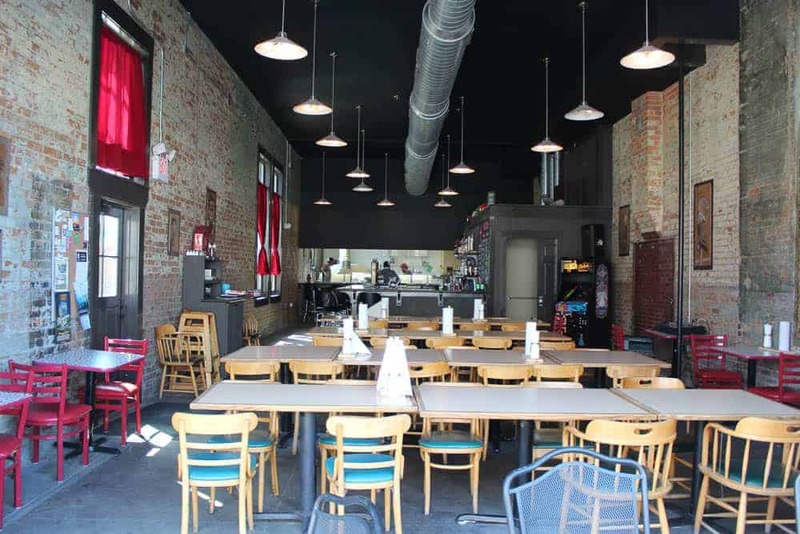 After all, who can resist a great wood-fired pizza that’s cooked and served in an old firehouse?! It might be tough to see but that top picture is the old firehouse with the door up in the front. We got to enjoy this warm spring day as they had the firehouse door up, exposing the entire restaurant to some very welcomed sunlight and fresh spring air. 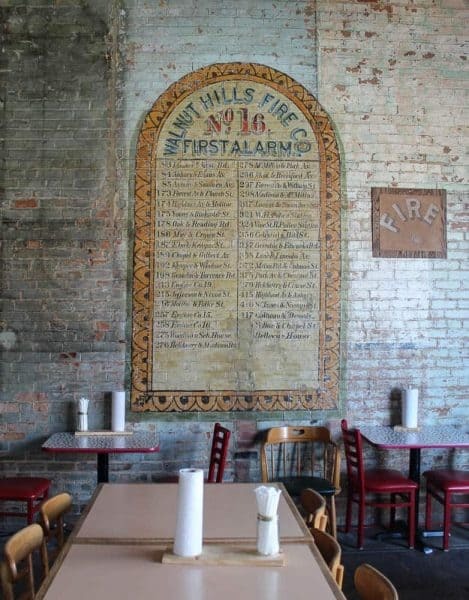 Fireside Pizza is located in the city’s oldest remaining firehouse – Fire Company 16 (which was disbanded in 1978 after, of all things, a fire). Designed by Samuel Hannaford, the firehouse was built in 1870. You can read more about the history of Fire Co. 16 and see a few old pics here. As we often do, we pulled up a few chairs at the bar and sat down for lunch. We introduced ourselves to the bartender (Chris) and asked him what he recommended. He pulled out the menu and told us a few crowd favorites. The pizza comes in two sizes – 9″ and 14″. 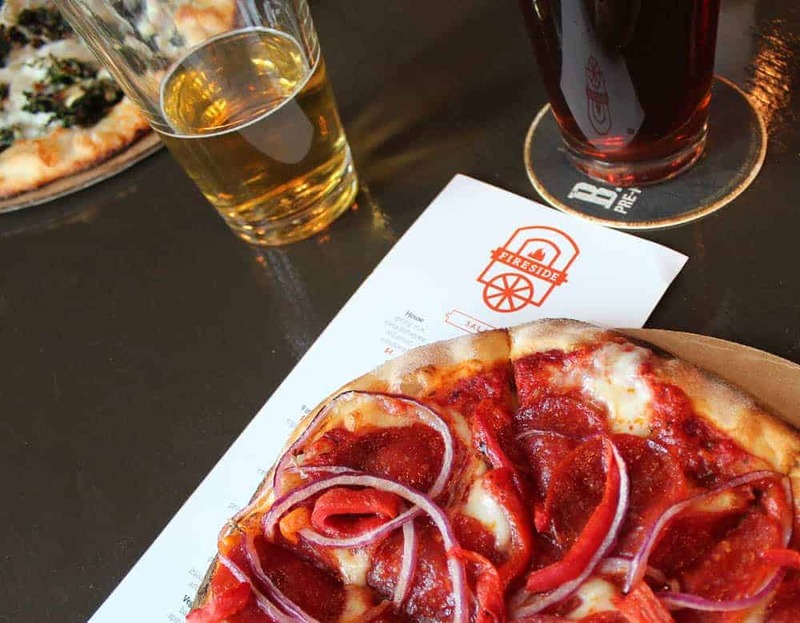 We decided to try two 9″ pizzas and chose their Seasonal Pizza and The Redlegger. 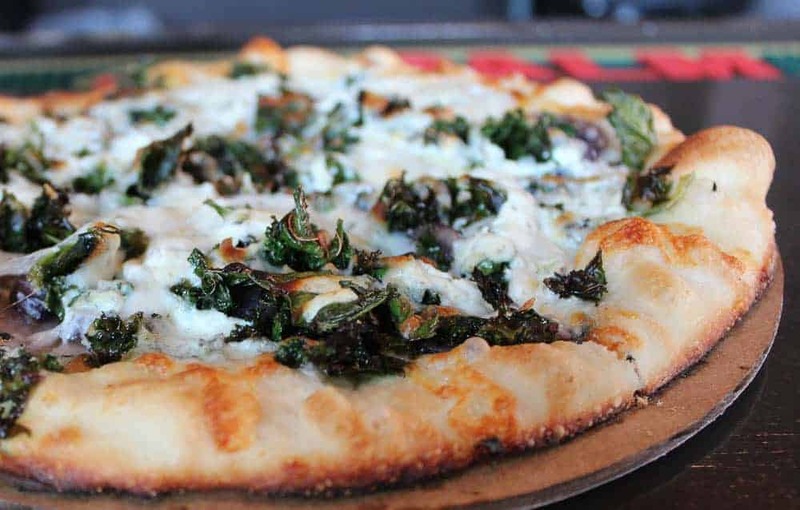 Seriously, this is one amazing pizza. We devoured that thing and I would order it again in a heartbeat. And my choice was The Redlegger – pepperoni, red onion, roasted red peppers, red sauce, and fresh mozzarella. This was also a great one and one I’d order again. The pizza was covered with toppings but not so heavy that it seemed excessive. The sauce to crust ratio on both was perfect. I am not a heavy sauce lover when it comes to pizza and I found both of these pizzas to be incredibly well balanced. And that crust! It’s what every pizza crust should be like. It was thin, yet strong enough to hold up when you picked up a piece. And it’s one of the only times I’ve looked forward to eating the plain crust because of the crispy texture. In addition to the pizza, they also offer a House and Caesar salad option. 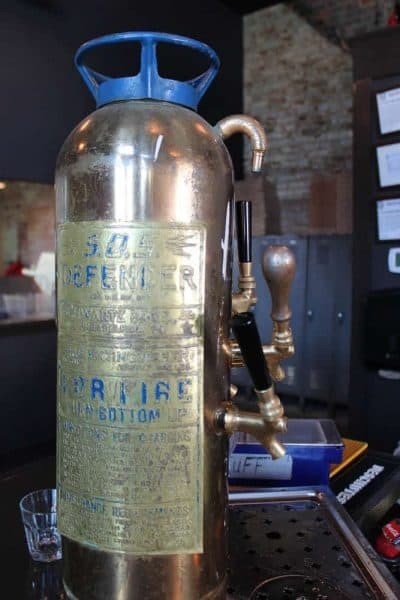 Fireside Pizza does have a full bar with a number of beers on tap and a very nice selection of bottled beer as well. There’s plenty of parking in a paved lot on the opposite corner.